Nineteen-year-old Estelle, a student in Paris posted some pictures to save others from the reactions of DIY hair dye. Estelle clarified that she almost died following a serious allergic reaction on her hair scalp. 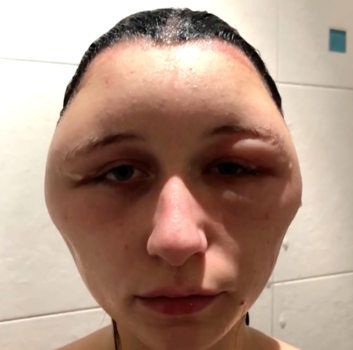 She told a local news outlet, Le Parisien, that her head nearly doubled in size and she was left fighting for breath because of the extreme reaction of the color. When she applied it, she felt something wasn’t right as her scalp tingled. In any case, she admitted that instead of doing the patch test for 48-hours, she just waited for thirty minutes before putting the color everywhere on her head. She said that she had a reaction to a home hair dye pack which contained a chemical called paraphenylenediamine otherwise called PPD. The chemical is found in many hair dyes. Situation got worse, when her scalp started to swell, yet she took a few medicines and applied a cream before going to the bed. Yet, the next morning she woke up to a much more worse circumstance and saw her swollen head, that measuring 63 cm. FYI – The measurement of an ordinary head is 57 cm in male and 55 cm in females. Fortunately, Estelle has been left with no harm to her health, yet she’ll definitely not color her hair again.